Vaughan Williams withheld many of his earlier works, written while he was still finding his own voice. It is only in the last decade or so that these works are being recorded. Hyperion released a double CD of early chamber works back in 2002 (review), and the VW Society’s label, Albion Records, has been doing sterling work unearthing these forgotten pieces. The Solent and the Fantasia are two such works. Albion released the first recording of the former in 2013, a release I included in my Recordings of the Year (review). Somm gave us the Fantasia (or Fantasy as they titled it) a couple of years earlier (review). For me, the absence of The Solent, described by the composer as one of his most important works, for so many years is a huge shame, as it deserves to be have been in the public eye from its time of writing. He did re-use the haunting opening clarinet theme in a number of works later in his career. It must be one of the first works to show his mature voice. The string tone in the highest registers was a little thin and reedy in this Naxos version, especially in the hushed early minutes, suffering in comparison with the Royal Liverpool Philharmonic on Albion. Matters improve with the grand brass-laden theme that follows. Vaughan Williams was not known for his keyboard works, and while I would not want to suggest that I know more than the writer of the notes, I haven’t seen the phrase “Vaughan William’s mastery of the piano” anywhere else. The Fantasia is certainly a work of a composer yet to settle on his voice, and while there are many enjoyable moments, they are almost exclusively in the orchestral accompaniment. One can hear Brahms, Tchaikovsky and Grieg in the background, but nowhere does the work reach even the slopes of the mountains that are their concertos. The Suite is the original version of the orchestral work, the Charterhouse Suite. It is described here as a world premiere recording, which my fellow reviewer, John France, finds hard to understand, given the presence of a 1981 recording by Peter Jacobs. It is certainly a first digital recording, beating by some months Mark Bebbington’s version for Somm (review). It is short and sweet, played with precision by Sina Kloke. I do find the inclusion of a solo piano piece, especially one so slight, among orchestral ones to be rather awkward. 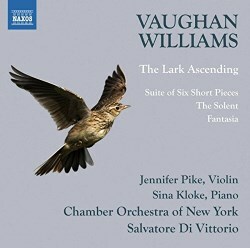 It is quite possible that a purchaser of this recording could be obtaining their first version of The Lark Ascending, but for most, it will be an addition to an already healthy collection. Jennifer Pike, the youngest ever winner of the BBC Young Musician of the Year in 2002, has a quite big, robust tone, which, for me, takes away some of the soaring hypnotic quality of the writing. Likewise, I don’t feel much of that sense of soaring in the orchestra’s accompaniment. Don’t get me wrong: there is nothing wrong with the playing here, but it doesn’t elevate as Tasmin Little, Hugh Bean or Pinchas Zukerman do. The notes, my reservations about VW and the piano aside, are well written, and the sound quality is good. I wish I could be more enthusiastic about the overall release.